Nickel (Ni) (atomic number 28 and atomic weight 58.69) has density of 8.902 gm/cc. 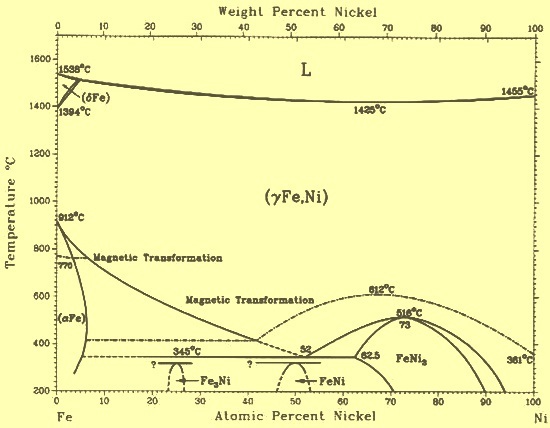 Melting point of Ni is 1455 deg C and boiling point is 2910 deg C. The phase diagram of the Fe-Ni binary system is at Fig 1. Ni has a face centered cubic (f.c.c.) crystal structure. It is ferromagnetic up to 353 deg C, its curie point. Ni is an important and widely used constituent of alloy steels. It is best known as a solid solution strengthener, a mild hardenability agent and, most important, as a means of promoting high toughness, especially at low temperatures. Ni is an important ingredient in stainless steel, helping it to prevent rust, scratches and resist heat. Around 65 % of global Ni production goes into the production of stainless steel. Ni alloyed steels contain as little as fraction of a percent to almost 30 % Ni. As may be expected, properties of these alloy steels range from strengths similar to plain carbon steel to some of the strongest metallic materials known. On the lower side of the Ni percentage in the steels are the alloy and HSLA (high strength and low alloy) structural steels. Hot rolled steels with yield strengths of 345 MPa may contain 0.50 % to 2.00 % Ni for toughness and added corrosion resistance. Age hardening steels contain 1.3 % to 1.5 % Ni plus copper (Cu) and niobium (Nb). Quenched and tempered or normalized and tempered structural steels contain nickel (Ni) up to 2.25 %, as well as a variety of other constituents including chromium (Cr), molybdenum (Mo) or boron (B). Ni bearing addition agents are ferro- nickel (Fe- Ni) ferroalloy, Ni containing steel scrap, Nickel oxide (NiO) and nickel pig iron. Fe-Ni is available in various grades with Ni plus cobalt (Co) content ranging from 18 % to 28 %. Co content in Fe-Ni is not more than 0.05 % of Ni content. As regards to carbon (C) content, Fe- Ni is categorized in three types namely high C, medium C and low C grades. High C Fe-Ni contains 1.8 % to 3% C, medium C Fe-Ni contains 0.25 % maximum C and low C Fe-Ni contains C as 0.02 % maximum and 0.04 % maximum. Ni pig iron contains 4 % to 13 % Ni and is smelted from low grade Ni ores. Nickel oxide (NiO) is a granular product and is widely used as an addition agent. Standard oxide sinter contains about 75 % Ni. The choice of Ni addition agent depends on product quality requirements, degree of refining possible in the steelmaking practice, individual steelmakers’ preference and experience, and availability. Ni recoveries during steel making operations are quite high and it is usually over 95 %. Ni has little effect on hot working characteristics of steels when present in small amounts. At the higher percentage levels usually available in the austenitic stainless steels, increased roll pressures are experienced and drafting is required to be reduced accordingly. Ni steels at high temperatures are susceptible to attack by sulfide atmospheres. Furnace gases containing, for example, H2S can cause the formation of nickel sulfide on grain boundaries and need to be avoided. The problem, when it exists, is marked by a tendency for the steel to crack or tear during hot working. On the other hand, Ni is usually added to steels containing copper (Cu) as it effectively prevents the hot shortness resulting from internal oxidation in these steels. Ni containing austenitic stainless steels can partially transform to martensite during cold working. This effect contributes to the high work hardening rate and increased rolling or drawing loads in these steels, but at the same time it also helps them attain extremely high strengths in the cold worked condition. Ni strengthens low C steels. It increases steel strength, impact strength and toughness. It also improves toughness at low temperatures when added in small amounts. Ni increases elastic limit of steel. Ni when added to steel, increases its density and hardness. It improves steel’s resistance to oxidation and corrosion. It also improves abrasive resistance of steel. Ni is heat resistant, and when combined with steel, it increases the heat resistance of that steel. Ni is rust resistant, making it ideal for the production of stainless steel. Addition of Ni in steel decreases the value of distortion (distortion energy) at the time of quenching. When steel is coated with Ni, or plated with Ni, then the Ni provides a scratch resistant surface to steels. Ni is a weak hardenability agent and is rarely used alone in conventional heat treatable alloy steels. However, it is often used in combination with other alloying elements such as Cr, Mo, or vanadium (V) to improve toughness. Ni has profound effects on transformation characteristics when present in higher concentrations. It is an austenite stabilizer. It tends to expand the gamma loop in the iron-carbon phase diagram. At very high concentrations (greater than 30 % Ni), no ferrite is present at all. Ni has got a property of lowering the eutectoid temperature in the steel. This change point on heating is lowered progressively with increase of Ni (approximately 10 deg C for 1 % of Ni), but the lowering of the change on cooling is greater and irregular. The temperature of this change (Ar1) is plotted for different Ni contents for 0.2 % carbon steels in Fig 2, and it is seen that the curve takes a sudden plunge around 8 % Ni. 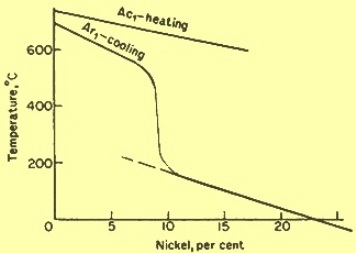 Steel with 12 % Ni begins to transform below 300 deg C on cooling, but on reheating the reverse change does not occur until about 650 deg C. Such steels are said to exhibit pronounced lag or hysteresis and are called irreversible steels. This characteristic is made use of in maraging steels and 9 % Ni cryogenic steel. Ni reduces the eutectoid C content, therefore Ni steels contain proportionately more pearlite in its microstructure than Ni free steels of the same C content. While effects of Ni are not strong in conventional alloy steels, Ni does have some influence on heat treating transformations. It retards both the pearlite and the bainite reactions. It has no effect on tempering as such, but care must be taken when tempering Ni steels at high temperatures for extended times. Under these conditions and because of the changes in transformation temperatures noted above, it may be possible to exceed the (lowered) Ac1 temperature and inadvertently reaustenitize the steel. The difference between the expected and actual Ac1 may be as much as 45 deg C.
Heat treatment of high nickel alloy steels can be quite different from that of conventional steels. Some examples are given below. Cryogenic steels containing up to 9 % Ni are used either in the quenched and tempered or double normalized and tempered condition. In the first case, these steels are water quenched from 800 deg C, tempered at 565 deg C and either air or water cooled. Double normalizing is carried out at 900 deg C and 790 deg C, respectively, air cooling after each step and then tempering at 565 deg C.
The 9 % Ni and 4 % Co ultrahigh strength steels are hardened from 830 deg C to 860 deg C by water or oil quenching. A refrigeration treatment at -87 deg C to -60 deg C is needed in order to transform any residual austenite. This is a micro-structural phenomenon to which Ni steels are normally prone. Double tempering at 200 deg C to 600 deg C and at 540 deg C to 565 deg C depending on strength level needed, is usually required. Though the ultra high strength 18 % Ni maraging steels are micro-structurally quite sophisticated and resemble super alloys in some respects, these steels are simple to heat treat. Austenitizing treatment is performed at around 820 deg C and is usually followed by a reasonable cooling rate. Aging for 3-6 hours at 480 deg C is required to complete the treatment. Distortion is so little that it is possible to heat-treat most of the steel parts in the finish machined condition. Ni has the ability to impart high toughness, especially at low temperatures. This property has led to the development of cryogenic steels having important applications in the transportation and storage of liquefied gases. Normally the lower the service temperature that a structural steel of this type must withstand without risk of brittle fracture, the more Ni it must contain. Thus, a low carbon 2.5 % Ni steel can be used down to – 60 deg C while 3.5 % Ni lowers the allowable temperature to -100 deg C and 9 % Ni steels are useable up to – 196 deg C.
Among the standard alloy steels, those containing Ni alone as the principal alloying constituent are rare. Instead, Ni is used in combination with other alloying elements to produce steels with excellent combinations of strength and toughness in the quenched and tempered condition. Most of these steels contain around 0.5 % Ni, although over 3 % Ni is found in some grades. Ni is used in carburizing and nitriding steels where it benefits both case and core properties. Steel containing 0.95 % to 1.1 % C, 1 % Si, 13 % to 18 % Mn and 7 % to 11 % Ni which is being a variation of Hadfield steel, is being used where extreme toughness as well as high wear resistance is important. Ni is required in 300 series stainless steels to produce the austenitic structure. A minimum of as 8 % is sufficient, but greater concentrations are required when fully stabilized austenite is needed. Grade 310 contains around 20 % Ni, while the sulfuric acid resistant steel (Alloy 20) contains 29 % Ni, 20 % Cr and lesser amounts of Mn, Si, Mo and Cu. The precipitation hardening stainless steels are essentially unbalanced austenitic grades (similar to grade 301) containing such hardeners as Cu, Mo, Ti, Al, Nb, Ta or V. Ni is also used in martensitic stainless steel grades (grades 414 and 431) where the presence of up to 2.5 % Ni prevents the formation of ? – ferrite. Ni is rarely used in tool steels as its presence promotes graphitization in these high carbon alloys (inhibits through hardening). However, some grades contain minor amounts of Ni for toughness, grain refinement and ease of heat treatment.